Yu-Gi-Oh! TCG Strategy Articles » Duelist Saga: Celebrate 15 Years of Dueling Greatness! Home > Special, What's New? > Duelist Saga: Celebrate 15 Years of Dueling Greatness! Duelist Saga: Celebrate 15 Years of Dueling Greatness! This year, we’re welcoming in Spring with something a little different! Duelist Saga launches this Friday, but other than the fact that it comes with three 5-card mini-packs, there hasn’t been much information available – until now. Read on to find out what Duelist Saga is, what it looks like, what the cards look like, and what sort of cards you’ll find inside! The first thing you’ll notice about each Duelist Saga box is the booster pack wrappers, which you can see because there’s a big window on the box to let you peek inside. If you’re the type of Duelist who likes to collect different booster wrappers, you’ll be able to add a bunch of new ones to your collection – 7 in all. Once you crack open those packs, you’re in for a surprise! For Duelist Saga, we’ve created a jazzed-up alternative version of the classic Ultra Rare foil pattern. It’s not the first time we’ve done an alternative version of a regular rarity in a booster – World Superstars used the prismatic Secret Rare pattern from when the pyramids were still young – but it’s the first new version of a standard rarity created since the colorful Rare cards from Duelist League. Sadly, photos don’t really do it justice, so you’ll just have to see it for yourself! The Duelist Saga set was originally planned to have 40 new cards – more than in any of Premium Gold’s outings – but by the time everything was said and done, there were 42 new cards instead! The new cards are a mix of cards from the animated series, manga series, and original cards inspired by the animated series. Here’s a sneak peek at one of them! One of the coolest cards in 2012’s Abyss Rising booster set was Attack the Moon!, a card inspired by the famous scene from Duelist Kingdom where Yugi orders his Giant Soldier of Stone to, well, attack the Moon, in order to cause the tides to recede, beaching Mako Tsunami’s monsters. Duelist Kingdom was the Wild West of Dueling. Duelists often made their own rules, and in fact, the various Yu-Gi-Oh! series have often had special rules that didn’t transfer over to the real life game. In Duelist Saga, you’ll finally have a chance to play with some of those special rules yourself thanks to a new Spell Card called Legacy of the Duelist! The effects of Legacy of the Duelist are pulled from various storylines in the original Yu-Gi-Oh! anime and manga series. The ability to “attack” Spell/Trap Cards is from the Duel atop Pegasus’ castle using Kaiba’s prototype Duel Disks. 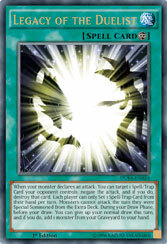 The limitation on Setting Spell/Trap Cards and “monsters from the Extra Deck can’t attack the turn they’re Summoned” are based on the Battle City rules, and retrieving a monster from your Graveyard instead of drawing is inspired by a particular scene from The Dark Side of Dimensions involving Kaiba retrieving a certain monster from a very literal grave to use against Aigami. If you’ve seen the movie, you know what we’re talking about. …and all the way to cards that haven’t seen the light of day for a considerable number of years! These 5 cards have revised text that allows them to return to play. During your 1st Standby Phase after this card’s activation: Show 1 Fusion Monster in your Extra Deck and send the Fusion Materials listed on it from your Main Deck to the Graveyard. During your 2nd Standby Phase after this card’s activation: Fusion Summon 1 Fusion Monster from your Extra Deck with the same name as the monster you showed, and target it with this card. When this card leaves the field, destroy that target. When that target is destroyed, destroy this card. You can send this card to the Graveyard; Special Summon 2 Level 3 or lower Beast-Type monsters from your Deck, but they have their effects negated, also they are destroyed during the End Phase. You can only use this effect of “Rescue Cat” once per turn. You can discard any number of cards to the Graveyard, then target the same number of cards your opponent controls; return those cards to the hand. 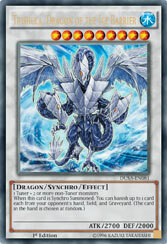 You can only use this effect of “Brionac, Dragon of the Ice Barrier” once per turn. When this card destroys an opponent’s monster by battle and sends it to the Graveyard: You can Special Summon that monster to your field in Defense Position. All “Gravekeeper’s” monsters gain 500 ATK and DEF. Cards in the Graveyard cannot be banished. Negate any card effect that would move a card in the Graveyard to a different place. Negate any card effect that changes Types or Attributes in the Graveyard. And that’s just the beginning! There are still 90 more cards where those 10 came from. You can learn more about the cards in Duelist Saga all this week leading up to the big launch on Friday! 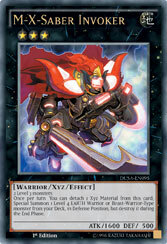 Duelist Saga: Blazar of Glory Fusion Enforcers is Now Available!